This handy little drain cleaner clears out clogs without having to take your plumbing apart—or use harsh chemicals. Simply crank the handle to work the long, flexible wand down the drain. The grasping hook and loop material on the end latches onto hair and debris. You reel it back up, then pop the disposable tip—and gunk—off into the trash. Your hands never need to touch the yucky stuff. This is the best thing since sliced bread. Really gets down in the drain to remove hair and gunk. Thank you! Just buy these, you will need them too! 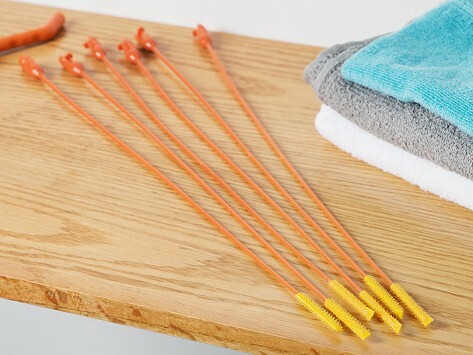 Unless you want to try to clean off disgusting yuk from the wand, which I DO NOT recommend you will need these! This drain cleaner clears muck out for you—without getting your hands wet or using harsh chemicals. Drain Weasel makes it easy to routinely keep pipes clean and clear, preventing bigger clogs from stopping things up. The long, thin design can help out pretty much any drain, regardless of size or shape. 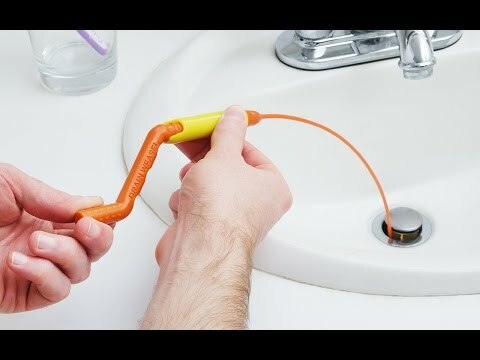 Steve Turner and his dad Scott created Drain Weasel to combat clogs without having to take the drain apart—or get your hands dirty. Crank the handle to circulate the wand, as its flexible body contours along curves. The tip snags debris with tiny hooks and loops, holding onto them while you reel it out. The best part is that the tip is disposable, so you can pop it off into the trash. Replace it with a fresh one for next time. With routine cleaning every few weeks, you can help keep your drains clear. And your hands clean.